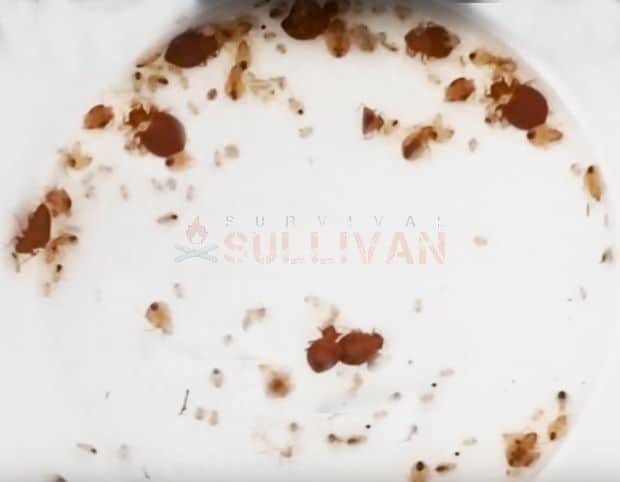 Crawling parasites can be the worst sort of nuisance, especially when you consider that in a post collapse situation there will be no running to the store for sprays, traps, or medicines. 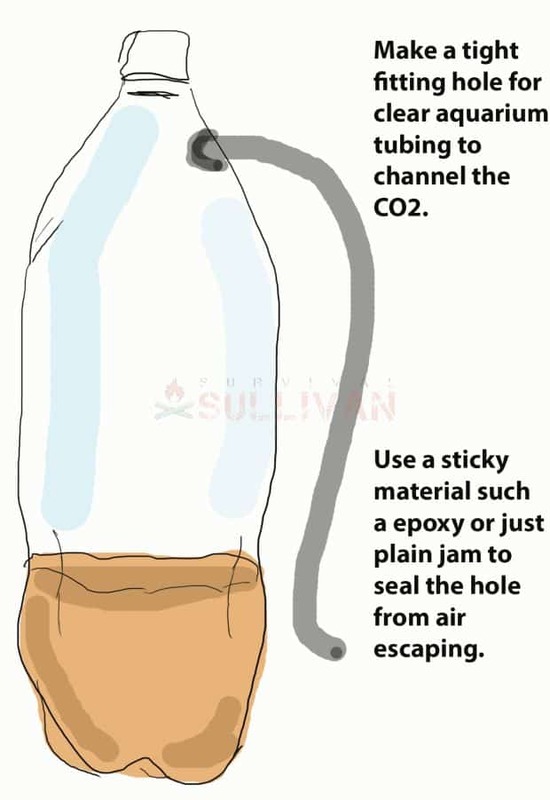 But with a few precautions using organic and all natural simple products you can live without additional “friends” in the woodwork, bedding, and on your pets. What are they? Fleas are parasites that are a dark brown black up to a light golden brown and when filled with eggs can be as big as a sesame seed. They move rapidly over your skin and their bite can be quite irritating. Once it is an adult, the flea spends almost its whole life on its host. Eggs can be produced and deposited on the host within 24 hours of the flea arriving there. With up to 200 eggs per laying cycle, this is how they spread fast. The eggs roll off the pet or are deposited in the bedding or any are your pet frequents. When the egg hatches, tiny larvae burrow into soft materials or dirt. They lay dormant for a few week if need be, and wait until the weather conditions are right. This is why sudden onslaughts of fleas can crop up during heat waves. Not being able to sit still, scratching and red bites are symptoms to look for. Fleas do bite humans and can jump a few feet so bites on the lower legs are indications fleas may be in the house. Flea infestations can cause anemia and tapeworms in the host, human or animal. Using topical applications can help prevent fleas from choosing you or your pet for a host. Natural repellants include essential oils, including garlic in your diet, and using food grade diatomaceous earth so it doesn’t cause respiratory problems, and treating bedding and carpets indoors to dry out any eggs. I used to spend a lot on the topical medications that basically made your dog’s blood toxic to the flea, but the flea has to bite the pet for it to ingest the toxic substance. This means they still can hitch a ride and then get into the house. It also made me think about what is going on with the dog’s internal system to make him toxic to insects. Bedding tip: I used to buy foggers and expensive powders, but the most effective substance I have used the last 5-6 years is basic table salt. After a good vacuum, I went through and sprinkled basic table salt on anything a flea could lodge or lay eggs in. Even in the mattresses and under the sheets. In the couches and pillows and we haven’t had a problem since. We had moved into a new house and that first spring was horrible for them, they do lay dormant in winter, so I think the people before us had cats or dogs and an issue. Washing tip: again I used to pay a lot for special dips and shampoos and of course the best alternative to that is so cheap- Dawn dish liquid. The dish liquid kills them on contact. If your best was hit by finding a nest while out running, or you can see them on him, then while dry squirt a line down from the top of his head to the tip of his tail. Soap the belly and undersides, herding them to the legs. For larger dogs start at the top and smooth the dish liquid down. For smaller dogs soap the face and around the ears and belly, then the back and sides. During this time the dead ones will start rising to the top. Then add water in a tub and place him in it, and then start adding water washing the fleas into it. If you start feet first or back first they will run into his ears or into his eyes and face. Pick off as much as you can, for the super big brown ones- full of eggs- it may just stun them for 5-10 minutes so flush or dispose of, you don’t want them waking up and infesting that area. For a repellant if he is out running, just squirt soapy water onto him to repel fleas. Ticks are most abundant from spring to late fall, but can be found all year long. A mild winter will escalate the numbers in spring making a boost in population. Symptoms The 2 types of types both can carry and spread disease, although the soft ticks bite is quite a bit more painful than the harder bodied tick. Once a tick bites you, you have 36 to 48 hours before any disease can be transmitted to a human host. 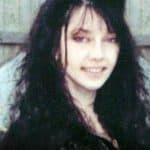 This is why it extremely important not to squeeze or pull the tick from where it’s rooted in the flesh, as they can “vomit” their innards into the host and any accompanying disease, including the dreaded tick-borne Lyme that ravages the nervous system. 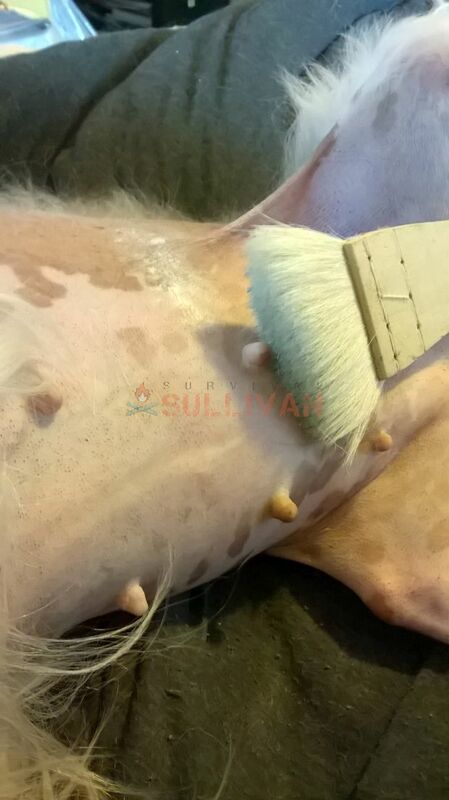 A reaction to the protein in the tick’s saliva is why most people first notice swelling, itchiness, and redness when bitten. the tick’s saliva can carry a toxin that is carried with the saliva, with the most dangerous being the toxin responsible for Lyme disease. The tiny deer tick is the known carrier of the Lyme disease toxin, and they are extremely hard to spot as most sizes can be scaled down to the size of a pin head and fit almost anywhere undetected. Due to the timeframe of disease transmission, it is crucial to do a body “tick check” on clothing and yourself after being outside, especially in heavy wooded and tall grassed lands. The tend to climb upwards to seams, and the more warm an area, the happier they are. Waist bands, tops of socks, collars and hairlines are spaces to check, plus any “warm areas” like armpits, ears, under chest and bra straps for women (embarrassingly I can preach to be true…do check). For pets and food bearing animals, the hottest areas are on the head and especially around the eyes, toes, and in the ears. Check them regularly for ticks. Humans. For the most part they survive solely on human blood. Bed bugs are small orangey-brown oval shaped bugs that feed directly on human blood. They are more active during the evening hours. Their numbers have soared with the increase in immigration and more international traveling. They are located all over the world and one of the most frightening facts is they like to hitch rides in suitcases to your home. They are found wherever humans are found as that’s their main food source. Crowded living situations, especially hotels and apartments with a high turnover of people, spread an infestation father quickly. The rash from a bed bug bite contains small raised bumps that are flat on top and inflame the skin. Inflammation, redness, and intense itching accompany bites. Bedbugs love to hide and finding them and eradicating their nests is the only recourse for this external pest. 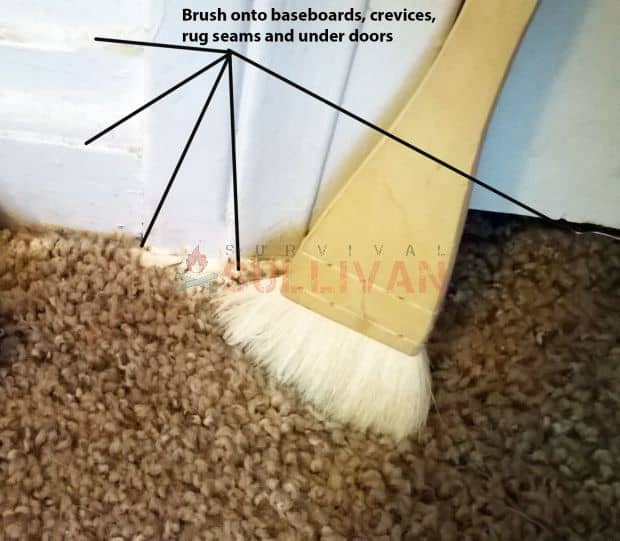 Look in the seams of any materials, corners, or cracks that touch fabric in bedding, bed frames, carpet, curtains, wallpaper tearing away, wicker furniture or dresser drawers. The telltale signs will be dark droppings that look like little droplets of blood, like in the seams of a bed mattress. Sadly, there is no treatment for bedbug bites. Showering to remove them and trying to not scratch open the sores to prevent infection is the only recourse. Removing them from the area is the only way to prevent further bites. 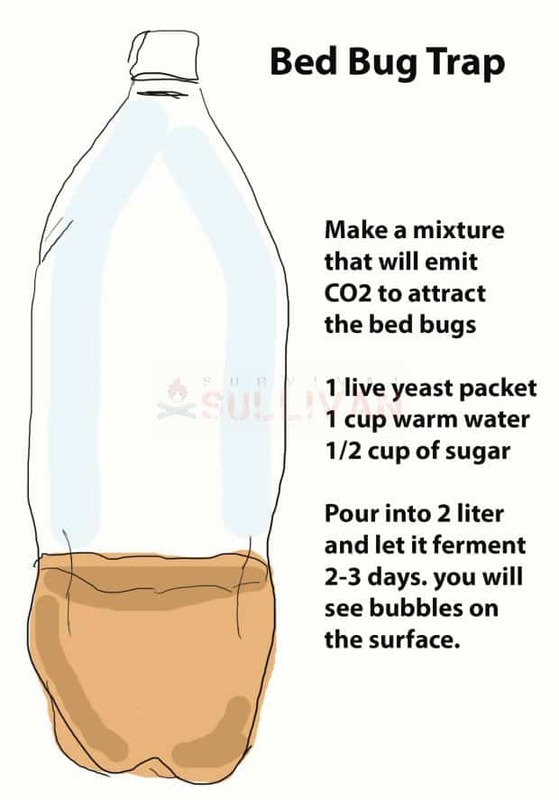 As the bed bug has an exoskeleton, using diatomaceous earth or baking soda can eliminate them as it enters the bugs exoskeleton and dries him out from the inside by getting into his respiratory system. Sprinkle it in cracks, drawers, seams, and carpets. Boric acid can be used also, but away from pets and livestock. 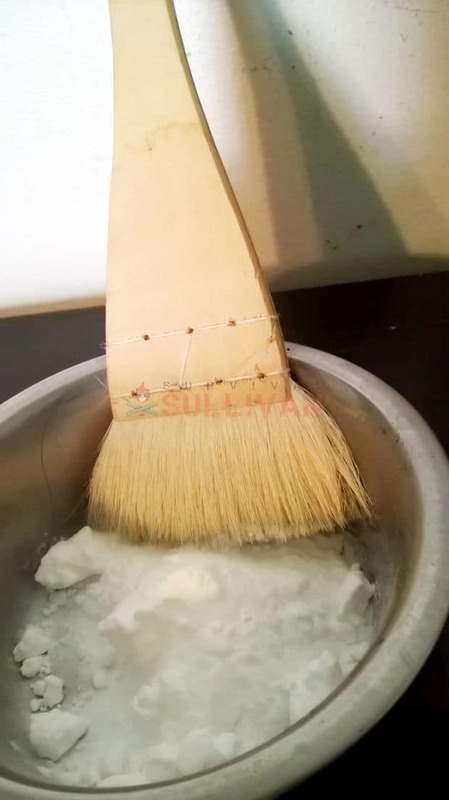 The best way to apply diatomaceous earth or baking soda to a mattress or hard to read spot is buy dipping a paintbrush into the mix, and then brushing it on. 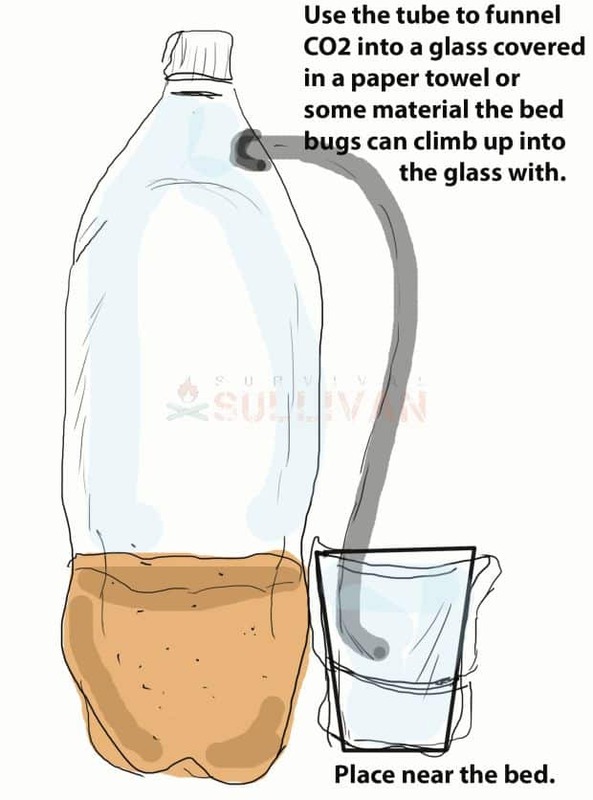 There are a few ways to construct a bed bug trap that can help catch the stragglers. 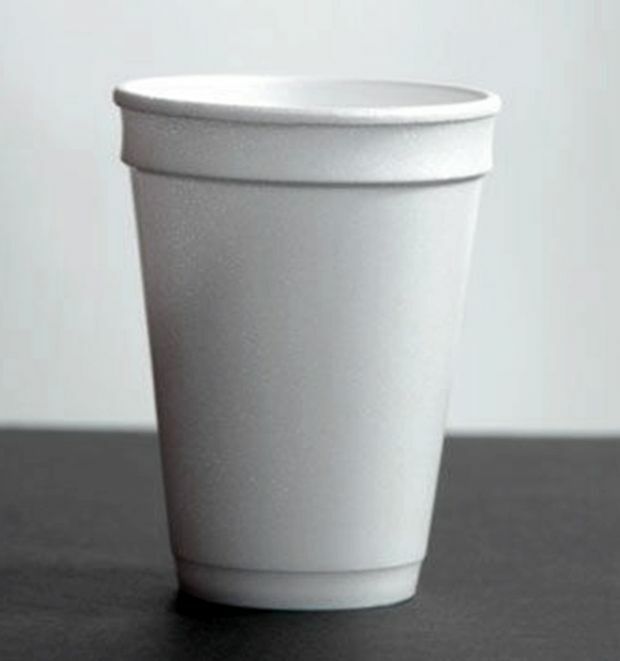 This is a great test using only a cup to determine where an infestation is. It is a very smart and effective trick to try if you are staying somewhere or checking a place out. As bedbugs will climb up the legs of a bed or dresser, set a regular cup under the bed by the leg. Check back in a few days. As they can’t climb out, any that were moving during the night then seeking refuge will be caught. Check out this horrible site from a hotel we were thinking of staying at. We didn’t stay. God knows what would’ve come home with us! Creepy crawlies can happen to anyone when you venture outside, so hopefully with these tips you can apply preventative measures and treat any outbreaks.